Later this year, directors Anthony Russo and Joe Russo will start production on Avengers: Infinity War (May 4, 2018), which will be shot back-to-back with another untitled Avengers movie (May 3, 2019). While no cast members have been confirmed, the directors have teased that these movies will unite the entire Marvel Cinematic Universe, with most fans assuming that all of the previously established MCU characters will show up at some point. With Captain America: Civil War debuting on Digital HD September 2, the Russo brothers have been making the press rounds, and today they dropped quite a big bombshell, confirming that Chris Evans' Steve Rogers is no longer Captain America. If you haven't seen Civil War quite yet, there will be SPOILERS so read on at your own risk. At the end of Civil War, after the epic one-on-one fight between Steve Rogers/Captain America (Chris Evans) and Tony Stark/Iron Man (Robert Downey Jr.) Cap drops his iconic shield, and we never see him pick it up again. 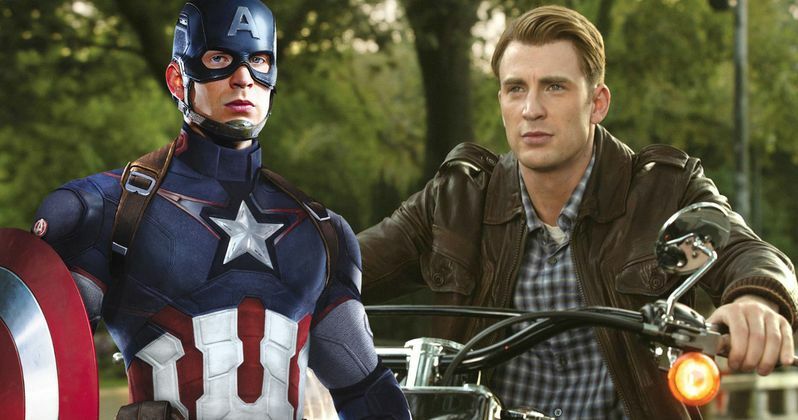 The Huffington Post caught up with the Russo Brothers, who confirmed that Steve Rogers is dropping the Captain America identity. Here's what Joe Russo had to say below. "I think him dropping that shield is him letting go of that identity. [It's] him admitting that certainly the identity of Captain America was in conflict with the very personal choice that he was making." Of course, just because Steve Rogers isn't Captain America anymore, doesn't mean we won't see him in Infinity War. Writer Christopher Markus teased that Steve Rogers will still be "helpful" in taking down the "big purple guy" who's coming, Thanos (Josh Brolin), while the Huffington Post speculates that Steve Rogers could turn into The Nomad, which happens in the Marvel Comics after Cap becomes disillusioned with the government, which certainly happened in Civil War. Naturally, that hasn't been confirmed, but hopefully we'll learn more as we get closer to Avengers: Infinity War starting production. In a separate interview with Entertainment Weekly, the Russo Brothers offered new details on what the third Captain America movie may have been, if Robert Downey Jr. had not agreed to come back. The actor had fulfilled his Marvel contract after Avengers: Age of Ultron, and had to re-negotiate a new deal, although both the studio and the actor were "playing hardball." The directors revealed that it was "never a given" that Civil War be the third movie, and one of the alternate takes they were looking at centered on the Madbomb, that would have pitted Cap against a horde of zombie-like humans. Here's what Anthony Russo had to say about the Madbomb story. Related: Does Far from Home Take Place Before Infinity War or After Endgame? "There was a period where we did discuss a third act that revolved around the Madbomb from Cap mythology. It didn't have anything to do with Civil War, and if we couldn't get Downey - in the very, very early conversations before we nailed him - somebody pitched the idea of a third-act that revolved around the Madbomb, which makes people crazy. It almost like zombifies them - but not literally. The charm of the Madbomb is that you turn hordes of people into berserkers. That was the physical challenge that Cap and company would have had to face." The Madbomb story was written and illustrated by comics legend Jack Kirby in 1976, which was a device similar to an atomic bomb, which emitted sonic waves and radiation to destroy the minds of everyone within the blast radius. The device was created by a group of wealthy citizens known as the Elite, with plans to detonate it during America's bicentennial to create anarchy, so the rich could rebuild from the country's ashes. The victims were still alive, but had extremely violent tendencies that could not be controlled. If they would have went with this story for the movie, Daniel Bruhl's Baron Zemo would have been the one to set off the Madbomb. Here's what Joe Russo had to say about why they were considering this story. "The notion of the Madbomb would have been Cap having to fight civilians and how he would he handle that. We were always trying to put him into these interesting moral conundrums because of his nature. That would have made a compelling third act because if civilians are the antagonists, how could he stop them without killing them?" After Robert Downey Jr. signed his new deal, they nixed the Madbomb concept, which was later used in the Season 1 finale of ABC's Agent Carter. Captain America: Civil War will debut on Digital HD September 2, and on Blu-ray and DVD September 13. Stay tuned for more details and footage from the home video release, and for more on Avengers: Infinity War as we get closer to production starting.